Before The Perfect Storm, before In the Heart of the Sea, Steven Callahan’s dramatic tale of survival at sea was on the New York Times bestseller list for more than thirty-six weeks. In some ways the model for the new wave of adventure books, Adrift is an undeniable seafaring classic, a riveting firsthand account by the only man known to have survived more than a month alone at sea, fighting for his life in an inflatable raft after his small sloop capsized only six days out. 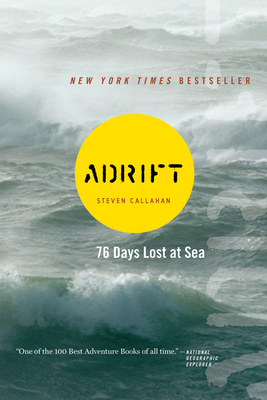 “Utterly absorbing” (Newsweek), Adrift is a must-have for any adventure library. Steven Callahan is the author of Adrift, Seventy-Six Days Lost at Sea, which chronicles his life-raft drift across half the Atlantic in 1982, became an NYT Bestseller and has been translated into 15 languages. He also wrote Capsized for survivor Jim Nalepka who spent four months with four other men on an overturned, half-flooded boat. Callahan has contributed writings, illustrations, and photos to more than a dozen other books, many about seamanship or survival, and has authored hundreds of articles for the marine press worldwide. His website is www.stevencallahan.net.